In a world where information moves fast, I feel like every time I open up the news something has drastically changed in some form or another. It almost feels like a form of whiplash. At the end of last week, we witnessed the implementation of President Trump’s executive order that barred migrants from 7 countries from entering the United States. This included an indefinite ban on Syrian refugees being resettled into the United States. People took up protesting all over the country at airports where travelers were being detained and sent back to their countries. 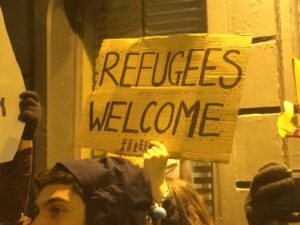 This outrage over, what some have taken to calling, the “Muslim ban” or “Migrant ban” was not contained to only the United States. 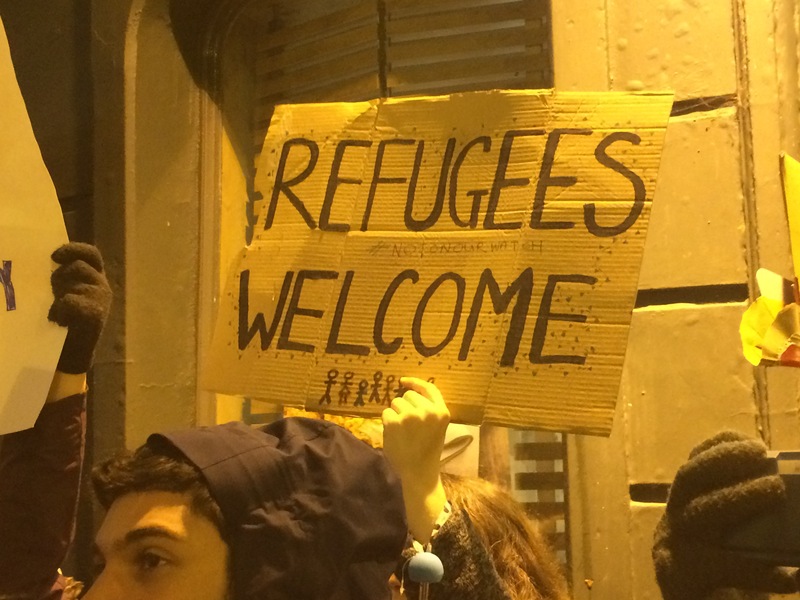 This past Thursday, sympathizers gathered in Dublin and Cork, Ireland in solidarity against the executive order that has been named unconstitutional by many civil rights organizations. The ban has inspired many to urge their government leaders not to support actions that have been taken by the United States government. At the protest in Cork, people gathered to speak out against racism, war, and inequality. Chants of “No hate. No fear. 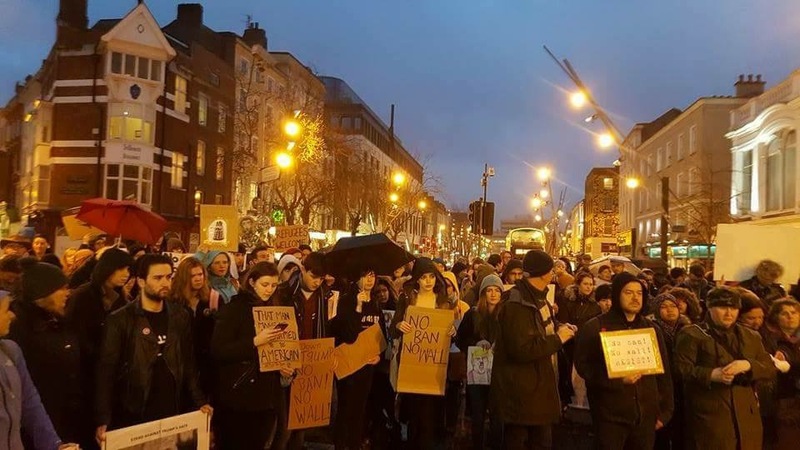 Immigrants are welcome here” resounded down Patrick Street as protesters marched to raise awareness of what is happening in the United States. In Ireland, people are also speaking out against Direct Provision Centers where asylum seekers are placed while they wait to be granted refugee or leave to remain status. Many people liken these centers to prisons, as the residents are living in cramped quarters with strangers, unable to prepare meals for themselves, and unable to take up employment. Refugees are waiting in limbo, sometimes for up to 10 years, while they wait to see if their case is strong enough to be granted asylum. Calls for action in Ireland to close these Direct Provision Centers were matched with disbelief of President Trump’s executive order. People unable to comprehend how fellow human beings who are fleeing to safety and want to be productive members of society are being rejected by countries that were built on immigration and freedom. The very next day, Judge James Robart, who was appointed a bench seat during George W. Bush’s presidency, issued a ruling that barred the executive order. This block can still be challenged, but now cases against the executive order can be taken to the Supreme Court. President Trump has already tried to overturn this block to his executive order but it was rejected until the full case can be heard. In the meantime, families are able to be reunited and refugees who were already scheduled to resettle in the United States are given some hope. This is not the end of the road. Things may change by next Friday. It is still up to us to make our voices heard and to speak out against racism and inequality. Don’t stop speaking out. Continue to reach out to our policy makers to encourage them to take a stance against policies based on fear and injustice.